For ATA versions 1.8 and higher, event collection configuration is no longer necessary for ATA Lightweight Gateways. The ATA Lightweight Gateway now read events locally, without the need to configure event forwarding. To enhance detection capabilities, ATA needs the following Windows events: 4776, 4732, 4733, 4728, 4729, 4756, 4757, 7045. These can either be read automatically by the ATA Lightweight Gateway or in case the ATA Lightweight Gateway is not deployed, it can be forwarded to the ATA Gateway in one of two ways, by configuring the ATA Gateway to listen for SIEM events or by configuring Windows Event Forwarding. If you are using Server Core, wecutil can be used to create and manage subscriptions to events that are forwarded from remote computers. After configuring port mirroring from the domain controllers to the ATA Gateway, use the following instructions to configure Windows Event forwarding using Source Initiated configuration. This is one way to configure Windows Event forwarding. 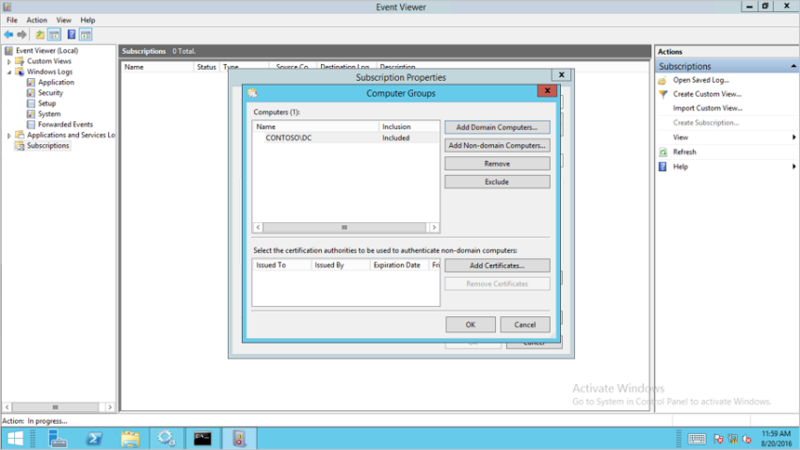 Step 1: Add the network service account to the domain Event Log Readers Group. In this scenario, assume that the ATA Gateway is a member of the domain. Open Active Directory Users and Computers, navigate to the BuiltIn folder and double-click Event Log Readers. If Network Service is not listed, click Add, type Network Service in the Enter the object names to select field. Then click Check Names and click OK twice. After adding the Network Service to the Event Log Readers group, reboot the domain controllers for the change to take effect. 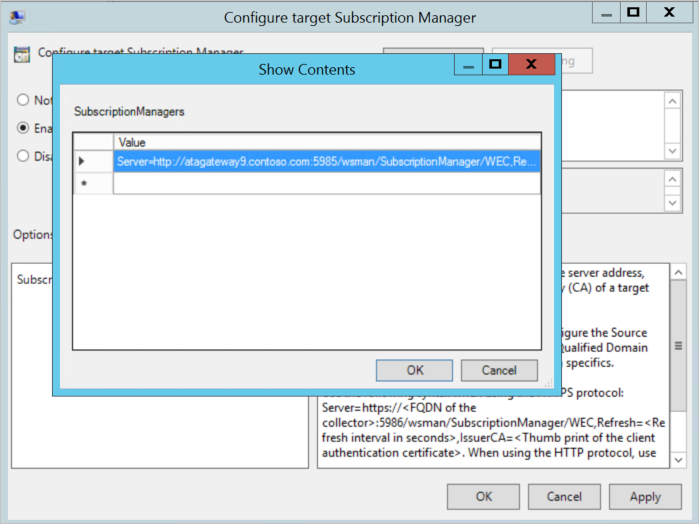 Step 2: Create a policy on the domain controllers to set the Configure target Subscription Manager setting. 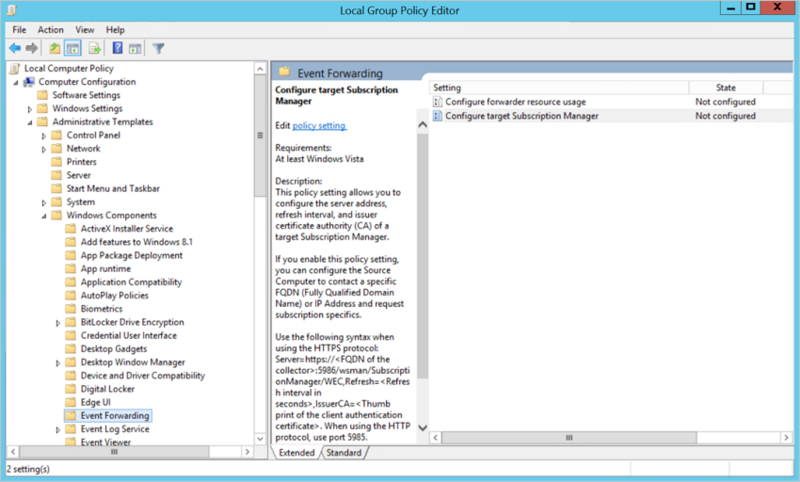 You can create a group policy for these settings and apply the group policy to each domain controller monitored by the ATA Gateway. The steps below modify the local policy of the domain controller. From a command prompt type gpedit.msc. Double-click Configure target Subscription Manager. From an elevated command prompt type gpupdate /force. Right-click Subscriptions and select Create Subscription. Enter a name and description for the subscription. For Destination Log, confirm that Forwarded Events is selected. For ATA to read the events, the destination log must be Forwarded Events. Select Source computer initiated and click Select Computers Groups. 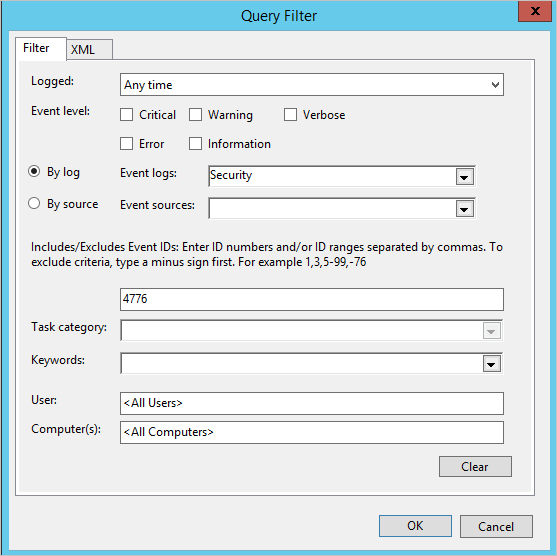 Enter the name of the domain controller in the Enter the object name to select field. Then click Check Names and click OK.
Click By log and select Security. In the Includes/Excludes Event ID field type the event number and click OK. For example, type 4776, like in the following sample. Right-click the created subscription and select Runtime Status to see if there are any issues with the status. After a few minutes, check to see that the events you set to be forwarded is showing up in the Forwarded Events on the ATA Gateway.